Why doesn't my Bluetooth headset pair with my new Smart Phone? Why doesn’t my Bluetooth headset pair with my new Smart Phone? Why doesn’t my Plantronics Bluetooth headset pair to my new Smart Phone? It worked fine for years with my older phone. I believe it’s a Discovery 975. With Bluetooth technology there are two attributes that need to be considered. The first is to remember that the newer model cell phones (and headsets) have more advanced “Profiles” to keep up with all of today’s advancements in technology. The second, and in your case more important, point is that as Bluetooth technology advances, new versions of phones and headsets come out to incorporate all the new features. It started with v1.0 and now we’re up to v4.0 with just about every fraction in between. So what does that mean for the headset user? Perhaps you’ve heard the expression “dummy down”. When you apply this formula to headsets, it means that higher version models can pair to phones of equal or lesser value (e.g. v4.0 headset with v3.2 phone but not the other way around). So, if you’re trying to pair your Discovery 975 (v2.1) to a new smartphone (v3.0 or higher), you’re going to have problems. 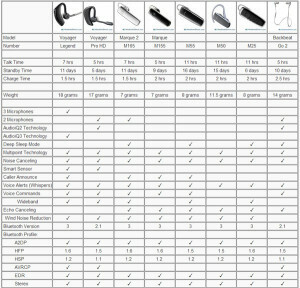 Call one of our sales experts at 800-914-7996 so they can assist you in selecting the right headset for your phone.